고려의 승려 보조국사(普照國師) 지눌(知訥)이 지은 『수심결(修心訣)』은 조선 세조 때의 승려 혜각존자(慧覺尊者) 신미(信眉)가 언해한 책이다. 목우자(牧牛子)는 지눌의 법호(法號)이며, ‘수심결’은 지눌이 선종(禪宗)과 교종(敎宗)의 대립을 막고 인간의 참다운 모습을 밝히고자 하여 저술한 글이다. 본서에는 ‘수심결’ 외에도 「환산정응선사시몽산법어(皖山正凝禪師示蒙山法語)」등 4편의 법어(法語)가 함께 묶여 있다. 규장각 소장본은 1467년(세조 13) 간경도감(刊經都監)에서 목판으로 간행한 책이다. 당대의 명필(名筆)인 안혜(安惠) 등이 정성들여 써서 목판에 새긴 후 닥종이에 찍은 것으로, 크기는 세로 23.1㎝, 가로 17㎝이다. 간경도감의 성격 및 초기 훈민정음 연구에 귀중한 자료이다. Susimgyeol is a sermon written by National Preceptor Jinul. Monk Sinmi of the Joseon Dynasty translated the original sermons into Korean. 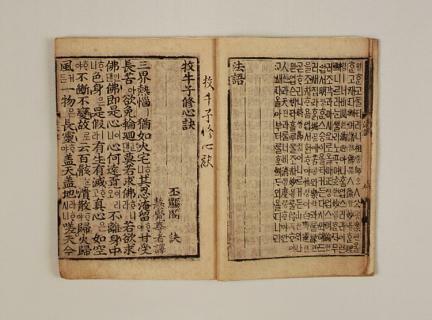 The Korean version was published in Gangyeongdogam, the institute at which Buddhist scriptures were translated into Korean, in the 13th year of the reign of King Sejo (1467) of the Joseon Dynasty. 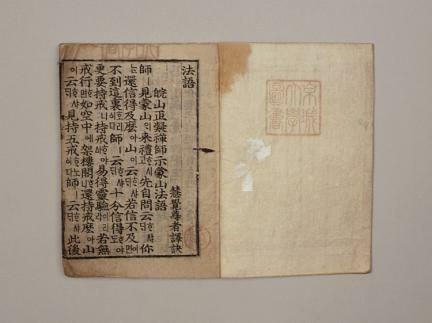 It is a woodblock-printed book, measuring 23.1cm in length and 17cm in width. 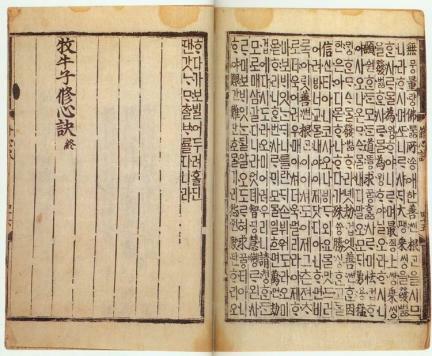 In the Korean version, 4 sermons including Hwansan jeongeung seonsasi mongsanbeobeo appear in the first part of the book, and they seem to have been published in 1467, the same year as Moguja susimgyeol. The book is well preserved and a valuable source for studying the character of the Gangyeongdogam institute, as well as the early stages of Hunminjeongeum, the Korean alphabet created by King Sejong .